October 12, 2018 Robert W.
Custom standing banners in Las Vegas are retractable banner stands that are very popular at the events and shows held in Vegas. There are hundreds of events and shows held in Las Vegas yearly that attract millions of people to come the entertainment capital of the United States. Las Vegas is also the convention and trade show capital of the United States and attracts the biggest and best trade shows from around the world with people coming from every nation of the world. All these events and shows have one thing in common: the need to signs, banners, banner stands and many other forms of signs. Custom standing banners are popular at these events because they can be set up in a minute or so and can be placed anywhere you want because they are free standing. Custom standing banners come with a carrying case which allows for easy transport and setting them is a breeze. 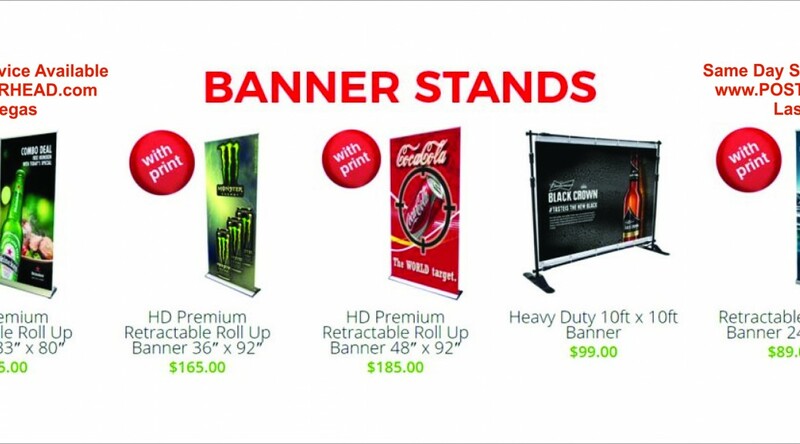 Retractable custom banner stands come in a variety of sizes to match your graphic needs. The most popular model, the approx. 33″ wide model by about 6.5 ft. tall sells with a custom print for under one hundred dollars. The design is printed on a 13 ounce vinyl banner material with eco solvent inks that is environmentally friendly but also rich and vibrant in color. There are many different standing banners to choose from such as a 24″ model all the way up to about a 5 ft. wide model to match your marketing needs. All these custom standing banners come with a telescopic pole which allows for height adjustment so that you get that perfect look for the stand. Custom standing banners can be found at participating sign stores in the Las Vegas area at very good rates because the sign shops do so much signage for the events and shows they get materials at a discount.